Ahh... Valentine’s Day. Some people love it, some people hate it, and being at UChicago, you’ll sometimes hear that Valentine's Day is just another capitalist ploy to get people to spend money. So, if you don’t want to drop a bomb on another gift (college students, yes I get your struggle), prepare to amaze with these sweet, decadent and boozy truffles. They taste absolutely heavenly and are very easy to make, package, and gift. Whether you’re spending Valentine’s Day with a special someone, partying it up with your “galentines” or just want a special Thursday night, these boozy truffles are sure to spice up your evening. Buckle up everyone, ‘cos you’re about to be (drunk)* in love. * The booze won’t get you drunk but it definitely packs a sizable punch in each individual truffle. Chop up the chocolate bars into small pieces. The best way to do this is to run the knife diagonally through the bar from one end to the other, beginning with the corners and angling the knife slightly outward. Transfer to a bowl. 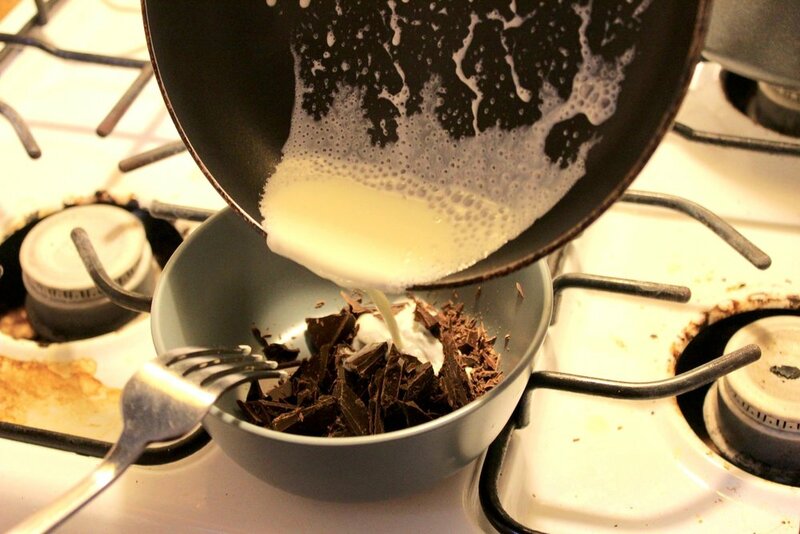 Heat the heavy cream in a pan on low heat. You want the cream to come to a simmer (tiny bubbles should form around the edges). Once that happens, count to five, then take the pan off the heat. Count to five again, then pour the cream into your bowl of chocolate. Stir the cream and chocolate together until smooth. If not fully melted, put the bowl into the microwave in 10 second increments and stir each time you take it out. Do not overheat the chocolate or it will seize up and separate. Once the chocolate and the cream are fully incorporated, stir in the alcohol. Take a piece of plastic wrap, place it over the bowl and press down until the plastic touches the surface of the chocolate. Place the bowl in the fridge for up to three hours or until it is hard enough to scoop. After that, use a tablespoon or a teaspoon and scoop into balls. I made mine to be 1 inch in diameter. Roll the chocolate balls it in your palms. You need to do this quickly or the heat of your palms will melt the chocolate. 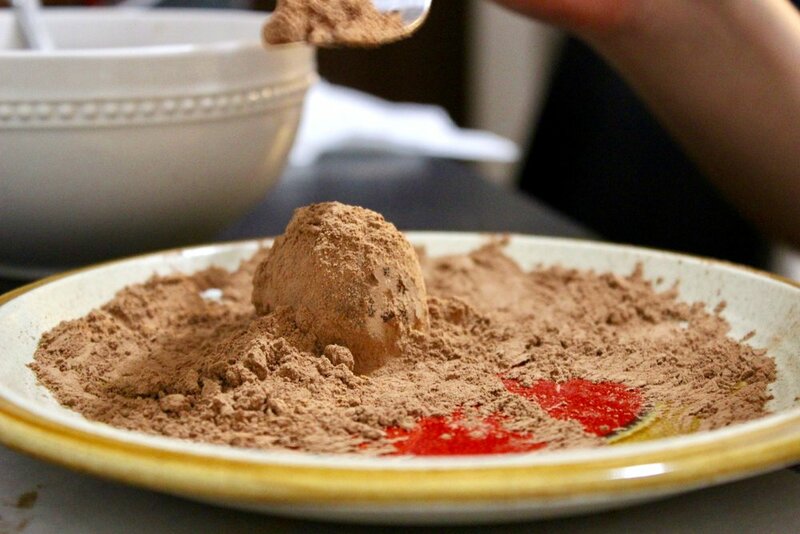 For bourbon truffles, coat the chocolate balls with a blend of cocoa and confectioners sugar. For Bailey’s truffles, blend the digestives/graham crackers, espresso, cocoa powder and confectioners sugar in a food processor. Coat the Bailey’s chocolate ball with this mixture. Pop the truffles back into the fridge. Before consuming, allow the truffles to sit out for 30 minutes to ensure that they reach the right consistency. Chop up the chocolate bars into small pieces. The best way to do this is to run the knife diagonally through the bar from one end to another, beginning with the corners and angling the knife slightly outward. Transfer to a bowl. Melt the butter in a pan. Then, heat the heavy cream in the same pan on low heat. 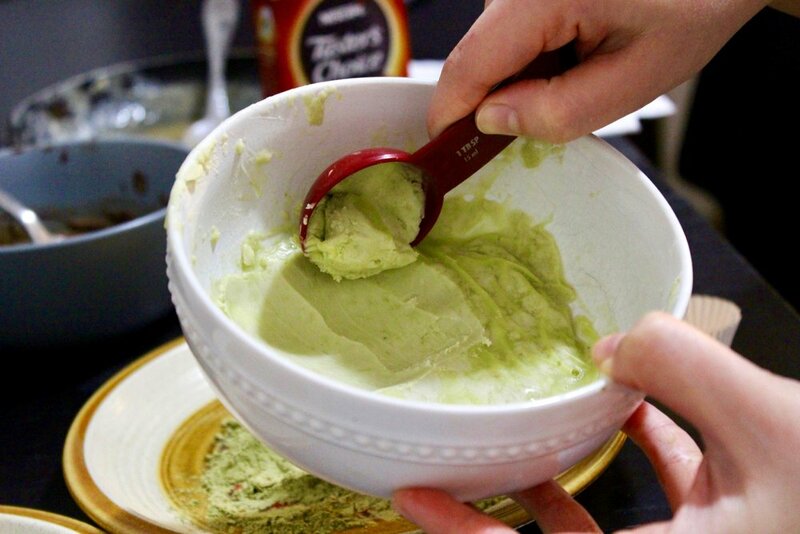 You want the cream butter mixture to come to a simmer (tiny bubbles should form around the edges) and once that happens, use a fork to whisk in the matcha powder. Do this quickly and do not let the cream come to a boil. Once fully incorporated, pour the mixture into the bowl of chocolate and stir till smooth. Progress with steps 3-7 from above. Coat the matcha truffles with a blend of matcha powder and confectioners sugar. ** Chocolate, especially white chocolate, seizes up if heated too quickly or abruptly or on too high a heat. Be sure to use the best quality chocolate you can find, and make sure all your bowls and utensils are not wet before use.